FIRST minister Alex Salmond has pledged that Shetland would be handed all net revenue from leasing the seabed around its coastline if Scotland says yes to independence later this year – which could amount to millions of pounds a year. 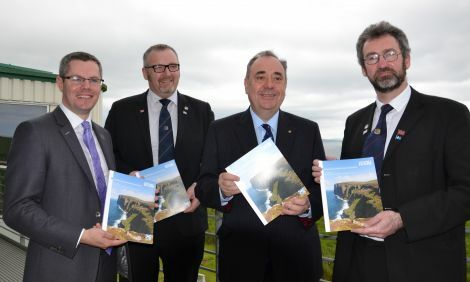 The SNP leader was in Kirkwall on Monday morning to launch the 80-page ‘Empowering Scotland’s Island Communities’ prospectus – the fruits of a year of “hard negotiations” between the government and local authorities in Orkney, Shetland and the Western Isles. Shetland Islands Council leader Gary Robinson hailed the announcement – which could see seabed revenue generated through leases for cables, oil pipelines, salmon farms and marinas flowing straight to the local authority’s coffers – as a “real result”. The government had previously pledged that at least half of the Crown Estate revenue would remain in island communities, but Robinson said the SNP had sprung a last-minute surprise and surpassed the three councils’ expectations with its 100 per cent offer. But the islands’ Liberal Democrat MSP Tavish Scott and MP Alistair Carmichael dismissed the SNP prospectus as a pre-referendum “bribe”. Scott said the government had consistently centralised power, such as control over police and fire, to Edinburgh and it was “very disappointing to see that only minimal responsibility will be returned tot he isles should they back Alex Salmond’s push for independence”. Western Isles leader Angus Campbell joked that, following 12 months of protracted talks, he was disappointed that the government was not offering 120 per cent of Crown Estate revenue. Robinson said it had been one of the “key planks” of the tripartite Our Islands, Our Future campaign, and claimed the offer had “paved the way” for the UK government – currently working on its own proposals for greater islands autonomy – to match the pledge. Robinson said it had proved difficult to get information from the Crown Estate specifying just how much seabed leases were worth, but it has the potential run into millions of pounds annually for Shetland. “It’s a moving target at the moment because the income is only going to increase from the seabed particularly as more marine renewables come online,” he said, “but it is a significant sum when you take in all aspects of the Crown Estate, from things like aquaculture to pipelines and cables. The prospectus contains a mixture of measures which could be introduced now and others which would only be implemented following a Yes vote on September 18. Orkney’s council leader Steven Heddle described the launch as a “hugely significant milestone” for the campaign, which has taken a “politically neutral” stance on independence. He praised the government’s willingness to “consider, negotiate and respond positively to the arguments we’ve made”, adding there was now a “far greater understanding of the unique nature and needs of our island communities”. But Scott dubbed the SNP’s offer as a “referendum bribe” and claimed islanders were “sick and tired of seeing local powers diminished and transferred to the central belt”. Salmond rejected that assertion, saying the prospectus was “the most comprehensive package for empowering Scotland’s island communities that has been put forward by any government”. He insisted it was a “comprehensive refutation” of the charge that the SNP has seized powers away from the islands. To ensure islands’ special needs are given a stronger voice in Europe. Salmond said the offer would help unleash the Scottish islands’ “huge potential” and create a “sustainable and prosperous future”. Salmond told Shetland News the government remained “absolutely committed” to ensuring an interconnector cable is laid to hook the islands up to the National Grid. He said renewable energy developments were being hampered by the Westminster government’s “inability to persuade and to make sure its regulator puts forward a proposition that enables the enormous generating power of these islands to be harnessed into the grid”. Robinson said that, if implemented, the ‘Empowering Scotland’s Island Communities’ proposals would help “maximise the opportunities presented by fisheries and aquaculture, and realise the full potential of marine renewables, while protecting our pristine environment”. While Our Islands, Our Future has garnered widespread – if muted – support in the main, a handful of local activists argue that the councils should have been bolder in seeking more powers. Robinson acknowledged that “a fairly small minority of people were saying we should have played the oil card more than we did”. But arguments over whether Shetland could “demonstrate some ownership of the oil” has “run and run for 40 years – we weren’t going to be able to resolve that argument in a short space of time”. He called for action to ensure the islands receive community benefits similar to those mooted in relation to fracking developments in England to reflect the “huge risk” of offshore oil and gas developments west of Shetland. He added the SNP’s seven-year council tax freeze meant it now only amounted to seven per cent of SIC income. Robinson supports a new form of local taxation, saying “we’re reaching a point where [the freeze] can’t continue – the sooner we move on the better”. In response Salmond said the council tax freeze was “a necessary measure to protect people from the ravages of first the recession, and then the period of austerity” following the global financial crisis. “I don’t think you’ll find many folk who don’t appreciate the fact that the one bill that hasn’t gone up in the last six years is their council tax,” the first minister added. The 80-page prospectus can be downloaded here.